So this next finished object technically falls under the "Christmas Crafting" category (dona nativitatis matri), but I'm so embarrassed that it's taken me this long to blog about it that I'm just going to label it as usual. Back around Thanksgiving when the shopping season was just beginning, my mom mentioned that she would really like something to wear to (or while watching) Cal games. (She had the blue covered pretty well but was somewhat lacking in the gold department). I immediately logged on to Ravelry, we browsed through various scarf and shawl patterns, and it was clear she had a favorite. And I was quite pleased with her choice. Mods: As with the first one of these that I made, I left off the pretty edging. My mom wanted something simple and decided that straight edges would be best for her. I did add a row of eyelets, though, so the garter stitch border would look more like a border. Also as with the first one, I loved knitting this. And really, you can't go wrong with Koigu, in all its squooshy glory. Christmas morning, my mom said she loved it, which was really all I could ask for! Though I do realize that wearing or not wearing certain articles of clothing will not, in actuality, influence the outcome of any sporting event, I still tried to knit some good luck for the Bears into this shawl. I guess we'll see next year if it worked...knitting can be quite powerful. Stunning! Your mods are simple, but very becoming, especially the added row of eyelets to break up the border. Just gorgeous! 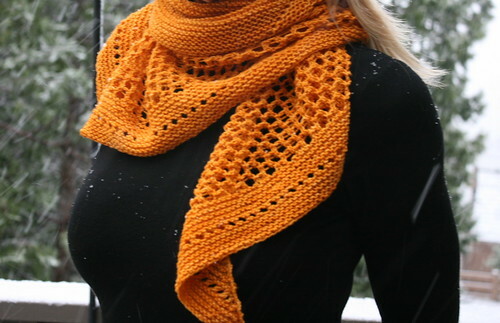 I much prefer this shawl design with the simple edging you used. What a great gift for your Mom ~ don't forget to let us know if the extra luck stitched in helps! Very lovely indeed! I'm obviously very flattered she picked out my shawl as the one she wanted! That eyelet row really does make a world of difference! And as usual, the stunning colour choice was the first thing to hit me. So beautiful! I'm a big fan of the colour, and hope its loveliness will spur on your desired sporting-event outcome. How pretty - I love the simplifying modifications you made! Even better that it was for your mother and that she likes it. 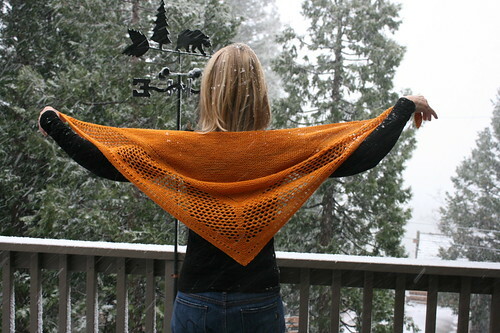 What lovely shawl - the color is such a ray of light in this dreary winter! I love the colour! and it looks amazing with the mods you did. Great job! your mom must LOVE it! it really is soooo pretty! Gorgeous! It's as pretty as all that snow around you. oh, i love that. i have been dying for somehting in that color lately. i bet your mom loves it! Very pretty! The color is eye catching and bright and I love your simple mods that really add to the pattern!